Does your iPad 3 have a dim, half dim or black screen and you can just make out an image? 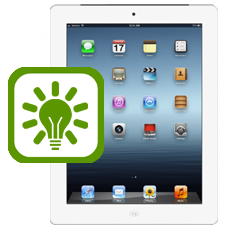 If so the odds are your back light circuit for the LCD has failed, this can be caused by water damage or fitting a low quality after market touch screen, or even a faulty LCD, however we can repair this fault, allow our expert technicians to replace the backlight circuit on your iPad 3. This is an in-house Apple iPad 3 repair service, when ordering this service you are required to ship your iPad into our repair centre for works to be undertaken. You will be sent shipping details once your order has been processed.